Many people at various times in their life will feel anxious or burdened by their financial situation. While not all circumstances are made equal, it’s important to take steps to improve, not worsen, the state of your finances. Remember, the world is still spinning. If you’re feeling overwhelmed by your financial situation or are feeling increased anxiety, this is a friendly reminder that panicking most likely won’t help. Not only can stress hinder your ability to deal with the issue, but it can also affect other parts of your day-to-day life, like work or school. The next time you feel your stress levels rise while looking at your bank account or credit card statement, relax, breathe, and try to think clearly about how you can change your situation. Although unexpected circumstances can cause significant financial stress, often, financial stress can also be the result of poor decision-making. It’s important to analyze your relationship with money and take accountability for your actions and how they have affected you financially. It can be easy to blame your circumstances – be it where you work or your salary – but if you take home a regular paycheck, it may be worth thinking about how you are spending it. Are there any changes, big or small, you can make today to improve your situation? On the other hand, if you have someone managing your money, such as a spouse or family member, do not blindly trust them with your livelihood and don’t be afraid to ask questions. It may be time to seek the help of a professional if you’re experiencing significant financial troubles. A financial advisor or planner could help you find better ways to manage your money and investments. Look for a financial adviser who is designated, like a certified financial planner (CFP). They’re licensed, regulated, and must take mandatory classes on different aspects of financial planning. Similarly, if you’re having trouble with your credit, you may want to seek the help of a credit counselor. The National Foundation for Credit Counseling’s members are accredited to ensure that their practices are ethical, and focused on serving the interests of their clients. While they make no guarantees to improve your credit, they will provide you with personal finance resources and help you with topics like bankruptcy and debt management. You might not be ready to dive headfirst into a meeting with an advisor or credit counselor, but you should still try to improve your financial literacy. Familiarizing yourself with financial terms is a great place to start. You shouldn’t be confused when you look at your monthly statements or financial documentation. Get better acquainted with best practices like budgeting, saving, and responsible borrowing to help improve your financial decision-making. An easy way to start is by checking out MoneyKey’s Resource Center; it contains articles on personal finance and budgeting tips. Financial stress can often be attributed to uncertainty surrounding money. Taking time to plan or set goals can help you visualize a future without as much doubt or anxiety. For example, you may have multiple credit cards that you think you’re never going to pay off, but paying off just one of those credit cards could help you rest easier at night. As you begin to set and execute more concrete goals, like paying off balances one at a time, you should start to feel your stress levels go down. The burden of financial stress can be difficult to carry, but it costs nothing to change your outlook. If you think that you will never be able to improve your situation, you likely won’t. A positive mindset can make a huge difference and helps you believe you can set and accomplish goals like those mentioned above. When you start to highlight the positives, you may reduce your stress levels and become more optimistic about your financial future. 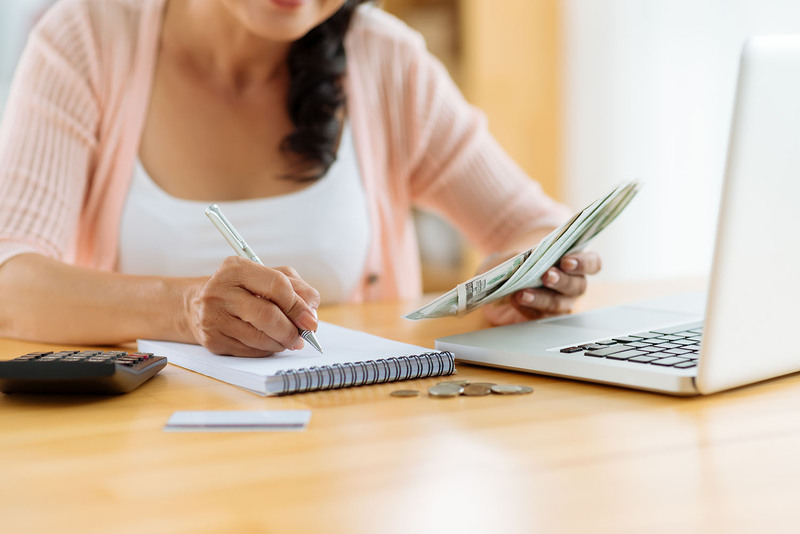 While your money woes may not go away overnight, taking the steps above can help you begin to take control and improve your financial situation.